The Ottawa to Pomona segment of the Flint Hills Nature Trail is now open for trail users. The 10.8-mile section was built by contractors for Kansas Dept. of Wildlife, Parks and Tourism using federal Transportation Alternative funds. A short stretch of marked gravel road (3.3 miles) has to be used between Louisiana Terrace and Iowa Road to make use of an existing rail crossing. The trail crosses the rebuilt Marais Des Cygnes River steel truss railroad bridge in Ottawa which will be turned into a signature bridge (with a swan theme) and become a destination for many visitors. Access points include Willow Street, the sports complex and the west road of the cemetery in Northwest Ottawa. Because of the detour some trail users park at Iowa Rd. and ride west to Pomona. The Pomona trailhead is on the very southern edge of the town on Colorado Road. Continuing south on Colorado Road for 1.5 miles and west on Labette Terrace for 800 feet is the historic Jesse James Cave (open to the public). The recreational path also passes near the wooded Chippewa Hills which lie three miles south on Idaho Road. The new trail segment is a major milestone in the development of the 117-mile rail-trail which will be the longest trail in the Sunflower State. A crushed limestone path stretching 1.5 miles through the Baker Wetlands has opened in South Lawrence. The treadway surface is suitable for road bicycles and walkers. The path begins at the Baker Wetlands Discovery Center and goes east to Haskell Avenue. The path traverses the old Baker Wetlands and a connecting path links it to the SLT Hike and Bike Path at Louisiana Street. KDOT built the path as well as the discovery center as part of the mitigation for taking wetlands for the South Lawrence Trafficway. The original 50 acres of virgin wetland prairie is still in existence but it is unclear if the whole Baker Wetlands lost its National Natural Landmark status when wetlands were destroyed to make way for the highway. The National Park Service is assisting with the design of a proposed 13-acre park which would be located along the Kaw River in North Topeka at the site of a landing where a ferry was operated by two Frenchmen: brothers Etienne and Louis Pappan. Thousands of Oregon Trail travelers crossed the river using their ferry. The goal of park planners is to develop it into an historic tourism site much like the Alcove Spring Park south of Marysville. Except for one parcel, the land has already been acquired by the City of Topeka (Source: Topeka Capital Journal, 8-21-16). Another branch of the historic trail called the Union Ferry Route crosses the Landon Nature Trail at SE 40th St. in South Topeka and heads to Willard where there was another ferry. A group called Cultivate Fredonia has recently expressed an interest in developing part of the Western Sky Trail which stretches 19 miles between Fredonia and Chanute. 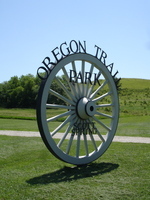 The organization was instrumental in developing a network of trails in a city park. Approximately $15,000 is available for trail development. However, first a volunteer must come forward to be the Project Coordinator who will marshal resources and organize volunteers. Sunflower Rail-Trails Conservancy railbanked this out-of-service rail line. 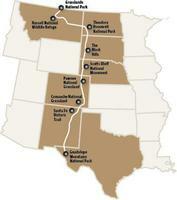 There is now a map of the Great Plains Trail which stretches from Canada to the New Mexico-Texas border. This trail uses existing trails and roads. Interest is building to develop the 9-mile Great Osage Trail which will stretch from Wellington to Oxford. A local banker has expressed interest in helping out with this project. Osage Indian Chief Black Dog established a trail from present-day Columbus to present-day Oxford to enable the tribe to travel to buffalo hunting grounds west of Oxford. The Southern Kansas & Western Railroad built the rail line between the two towns in 1879. The Atchison, Topeka and Santa Fe Railway took over the line in 1899. The last railroad to own the line, South Kansas & Oklahoma Railroad, let the rail line go out of service in 1997 and the rail corridor was subsequently conserved/railbanked under the National Trails System Act. Sunflower Rail-Trails Conservancy assumed railbanking custodianship in 2010. Seven miles west of Wellington lies the route of the historic 1867 Chisholm Trail which had its terminus in the famous cattle town of Abilene. Just north of Oxford is the 1874 Old Oxford Mill which used the Arkansas River to power the mill.